Johnston Emergency Hospital, established by the city of Milwaukee, opened in its permanent location on the corner of Third and Sycamore (now Michigan) Street in 1894. It provided emergency medical care in a twenty-four-bed facility. The hospital earned a place in history on October 14, 1912, when a would-be assassin shot presidential candidate Teddy Roosevelt in the chest at close range. Roosevelt opted to deliver his speech as planned and then visited Johnston Emergency where doctors took X-rays and kept him overnight. 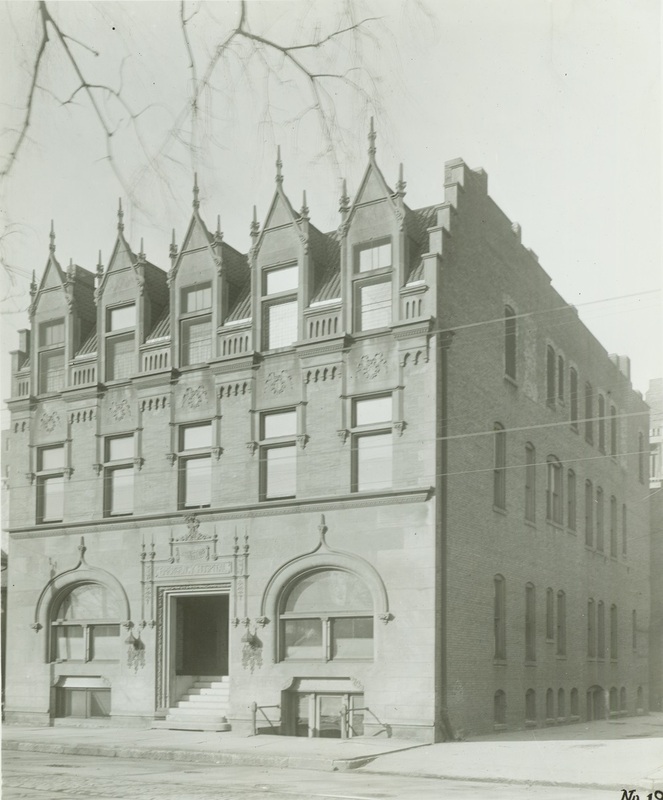 The hospital relocated to Milwaukee’s South Side in 1931, where it functioned as an emergency room and primary care provider before closing in 1978. ^ Judith W. Leavitt, The Healthiest City: Milwaukee and the Politics of Health Reform (Madison, WI: University of Wisconsin Press, 1996), 69; Steven M. Avella, “Health, Hospitals, and Welfare: Human Services in Milwaukee County,” in Trading Post to Metropolis: Milwaukee Country’s First 150 Years, ed. Ralph M. Aderman (Oconomowoc, WI: C.W. Brown Printing, 1987), 228. ^ Earl R. Thayer, Seeking to Serve: The Medical Society of Milwaukee County 1846-1996 (Wauwatosa, WI: Vilar Arts, Inc., 1996), 48, 241. See also Remember When…Johnston Hospital Was Open?, Milwaukee Public Library website, last accessed August 15, 2017. ^ Jay Joslyn, “Past Fills Empty Hospital,” Milwaukee Journal Sentinel, January 3, 1978, accessed January 20, 2014 http://news.google.com/newspapers?nid=1368&dat=19780103&id=3NMVAAAAIBAJ&sjid=5REEAAAAIBAJ&pg=5094,358180; “As Needs Changed, So Did Hospital,” The Milwaukee Journal, December 24, 1981, accessed January 30, 2014, http://news.google.com/newspapers?nid=1499&dat=19811224&id=NCAiAAAAIBAJ&sjid=oX4EAAAAIBAJ&pg=6516,1598192; see also Avella, “Health, Hospitals, and Welfare,” wherein the author notes that by 1925 Johnston had become inefficient, prompting the city to sell the hospital and give the funds from the sale to the County for the establishment of a new “Dispensary-Emergency Clinic” at 24th and Wisconsin. Avella, Steven M. “Health, Hospitals, and Welfare: Human Services in Milwaukee County.” In Trading Post to Metropolis: Milwaukee Country’s First 150 Years, edited by Ralph M. Aderman, 196-254. Oconomowoc, WI: C.W. Brown Printing, 1987. Gores, Stan. “The Attempted Assassination of Teddy Roosevelt.” Wisconsin Magazine of History 53, no. 4 (Summer 1970): 269-277. Thayer, Earl R. Seeking to Serve: The Medical Society of Milwaukee County 1846-1996. Wauwatosa, WI: Vilar Arts, Inc., 1996.